There are all sorts of practical reasons I’ve stayed with FMA over the years, but to be honest a big motivator is the simple fact it’s fun. From swinging a stick solo to going through drills with a partner to putting on helmets and gloves and sparring, I just really enjoy it. 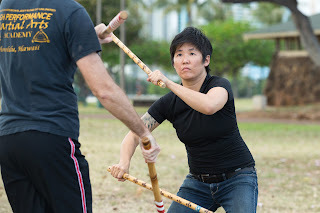 Is there a large community of people who practice here on Oahu? When did you become an instructor? 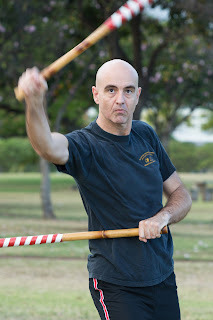 There is a decent-size community of FMA practitioners on Oahu. They aren’t as visible as, say, the Brazilian Jiu-jitsu community, but they are there. There are even a few competitions held each year. I became an instructor in both Kali and Jeet Kune Do in 2010. I am also a purple belt in BJJ. You mentioned the three main ranges of combat (kickboxing, clinch and ground). Are all three of these used in FMA? Yes. Clinch and ground work especially get really interesting when sticks are involved, and really scary when you introduce knives. 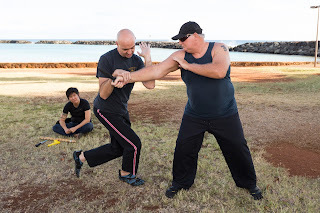 Much of the clinch work I do and teach originates from Silat, a martial art that originated in Southeast Asia and is practiced in parts of the southern Philippines. Silat takedowns are particularly brutal, and pair nicely with BJJ groundfighting. What are some physical and mental benefits to FMA? FMA is great for improving coordination and reflexes. Some of the drills require fairly complex footwork and your hands are often moving very fast. There is so much going on your mind has to be fully engaged. The hand-eye coordination and fancy footwork you learn in FMA carries over quite well to other fighting arts, especially boxing. Anyone interested in practical self-defense should do some training in FMA. 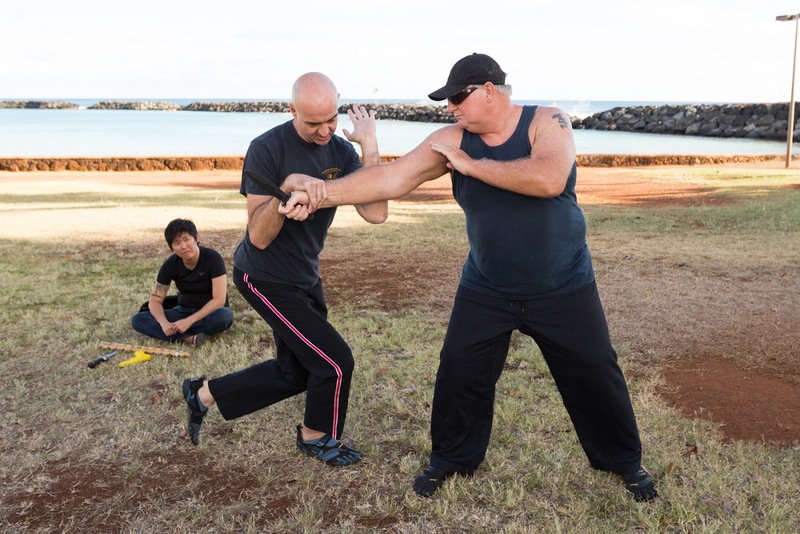 If you don’t know how to deal with the presence of a weapon—especially a knife—you have a serious gap in your self-defense skills. Even serious practitioners of other arts can benefit from a bit of FMA. People who might perceive themselves to be smaller or weaker than others can benefit from FMA because the art relies more on trickiness and “playing dirty’ than brute strength. Antonio "Tatang" Ilustrisimo, Grandmaster of Kalis Ilustrisimo, was sparring with young guys into his 80s and more than holding his own. What advice would you offer to first-timers? As with any martial art, be patient and open-minded. Some drills and techniques may seem odd or counterintuitive at first, but eventually they will click and make sense. Equally important is having fun. Learning to fight and defend yourself is serious business, but that doesn’t mean we have to be super-serious all the time. A sense of play will make the process much more enjoyable. Photos courtesy of Anthony Consillio of Consillio Photography. Thanks to Albert Cloutier and Kathryn Xian for taking part in the photo shoot!